Previewed at: Hoyts Cinemas, Broadway, Sydney, on 13 July 2017. Regardless of your opinion on climate change, there is at least one take-away in the new Al Gore documentary An Inconvenient Sequel: Truth to Power and that is ‘learn to swim.’ Why? Well in the last 20 years we have managed to increase global pollution levels faster and more significantly than in the past, with the result being melting ice caps and fiercer hurricanes, so Mother Nature will become more of a force to be reckoned with in the future. In fact, Jon Shenk and Bonni Cohen’s film shows us the site of the 9/11 attack in NYC being inundated during Hurricane Sandy, something climate change deniers scoffed at when Gore predicted just such an occurrence in 2006’s Oscar-winning doc An Inconvenient Truth. The question is whether or not one will be around to witness this significant sea-level rise and other disastrous weather events; in other words, how long will it take and can we do anything about it? So then, why does an almost 70-year-old man make a career of travelling the world attempting to make people aware of just how serious this problem is? Is he, as some people think, a fraud? Or is he someone with a conscience who believes in unearthing the truth and, possibly, changing humankind’s destructive ways? 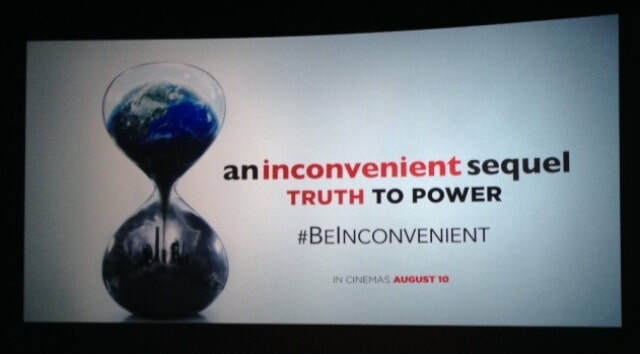 An Inconvenient Sequel: Truth To Power is the follow-up to the original An Inconvenient Truth (a two-time Academy Award winner) and in it Al Gore highlights once again the rising pollution levels that are exacerbating catastrophic climate change. He speaks to Heads of State such as Angela Merkel and Vladimir Putin and world figures like John Kerry, George W. Bush and Barack Obama, plus the Denier-in-Chief, President Donald J. Trump. It’s fascinating to listen to the varied opinions that emanate from the mouths of people elected to protect and provide a safe environment for those who did, and did not, vote for them. What’s even more intriguing is the feeling you get from many of these luminaries that it’s not really improving the earth’s environment that’s high on the agenda, it’s about how any changes would affect the global economy, the bottom line. This, of course, shouldn’t come as a surprise to anyone who seriously analyses political schemata but it’s alarming all the same. This is a must-see documentary, although it contains a few flaws and Al’s Southern drawl can be grating at times. As always with documentaries advocating behavioural change, it’s a shame that those who need to see it most probably won’t watch it. Nevertheless, Gore’s an effective advocate and he engenders some hope that it may not be too late to pull back from the abyss, especially after world leaders signed the 2016 Paris climate accord. The Agreement appears not to have made much difference so far, particularly since being hampered by the withdrawal of the US under Trump, so maybe we’d better consider purchasing flippers as well or, even better, building an ark, because history has a nasty habit of repeating itself.